One morning last week my neighbor called to ask about the plants blooming along the street at the very front of the garden. My neighbor is an artist and a gardener. He and his wife have filled their bit of forest with Daffodils, Rhododendron, Azaleas, Magnolias, and lovely tall trees. “Miss Huff” growing below Wax Myrtle, Myrica cerifera. The Wax Myrtle branches are covered in berries, nearly ripe for the birds. He had noticed our bright orange and yellow flowers, and wanted to inquire about them since they were untouched by our shared herd of deer. As you might imagine, few things make me happier than someone inquiring about beautiful plants. I was happy to tell him all about our “Miss Huff” Lantana, and invite him to stroll about the garden to see the rest of our Lantana shrubs. “Miss Huff”, growing along the street beneath the Japanese Box and Wax Myrtle are mostly left to take care of themselves. 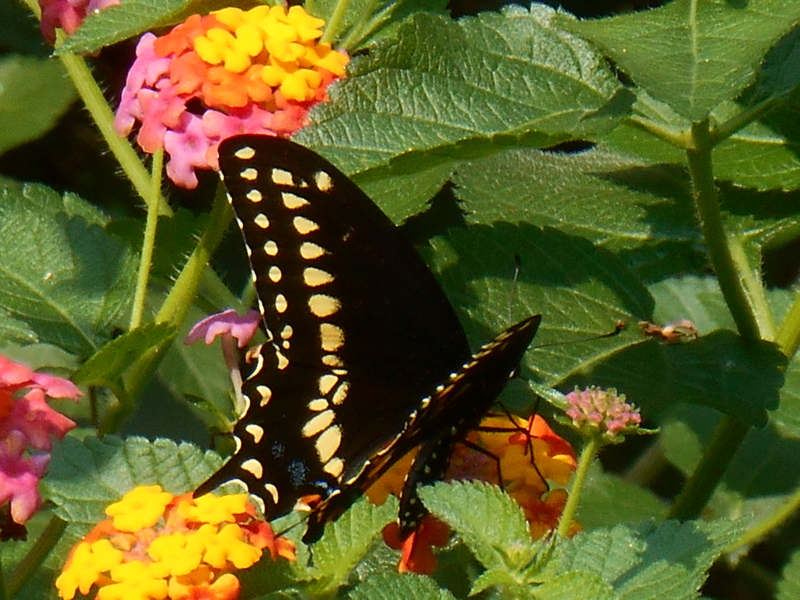 The walkers in our neighborhood enjoy watching the butterflies visiting the Lantana. We ended up going to Homestead Garden Center the next day and filling the car with nearly a dozen gallon pots of blooming Lantana for his garden. The Pattons had all of their Lantana on the “end of season sale”, and so for a small investment my neighbor bought all the Lantana camara he could plant. I’m looking forward to next summer when the beautiful golden orange flowers extend across the front of both of our properties. 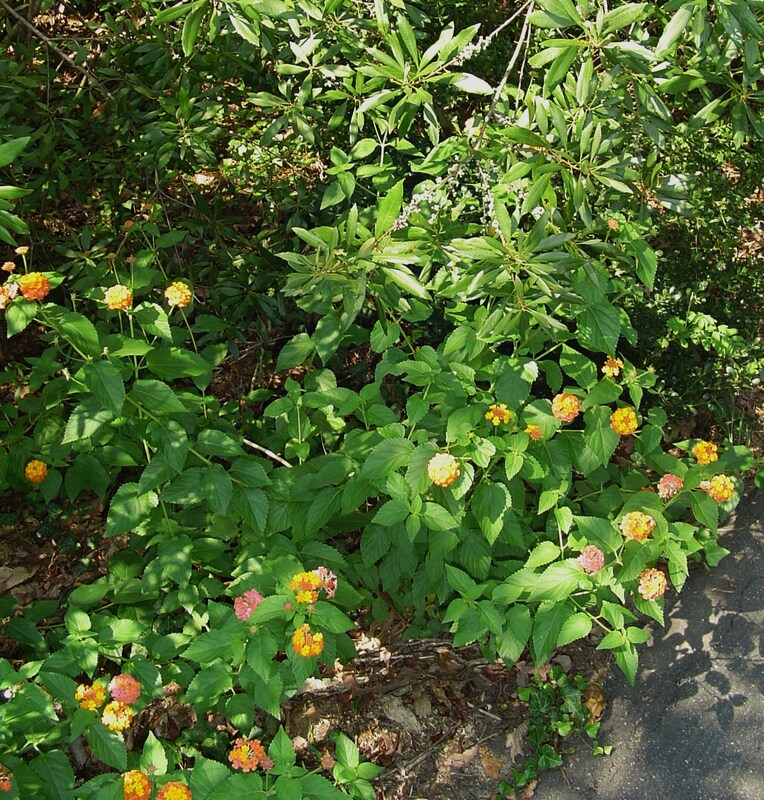 Most Lantana plants are treated like tender perennials in Virginia, and the tags generally say they are hardy in Zones 9-12. “Miss Huff” is a cultivar reliably hardy here in Zone 7B. 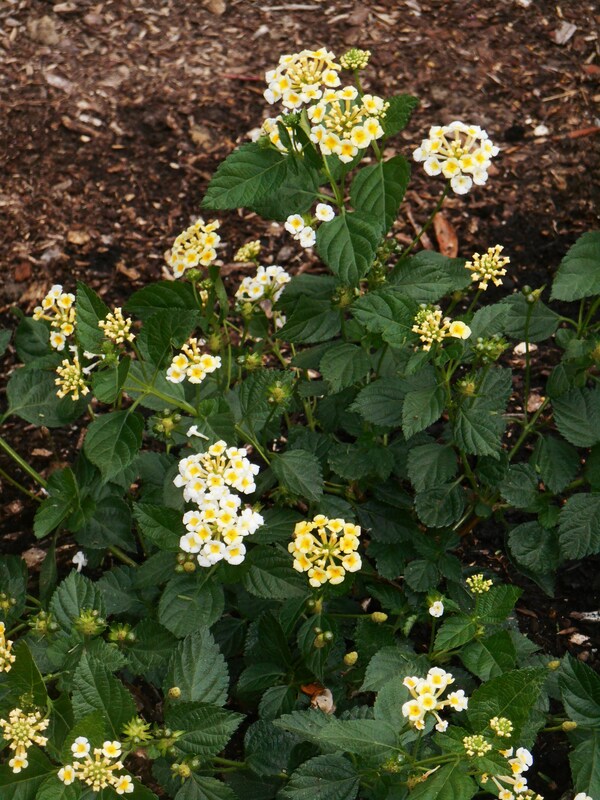 Now, Lantana would be well worth the price and effort if they were only annuals. They form dense, woody shrubs absolutely covered in flowers from mid-summer late into the fall. They are the hubs of activity in our garden, attracting a constant stream of butterflies, hummingbirds, moths, bees, and song birds. The birds find secure cover inside them and love the little berries which form once the flowers fade. Even better, Lantana thrive in full, hot sun. They require very little water, even in their first year. Once established, their roots grow very deep into the Earth, keeping them well-supplied, even in drought. Nothing seems to faze them. I’ve never seen one with any fungus or disease. It is rare to even see a tiny hole in a leaf. In fact, the leaves are toxic to most animals. This has created a problem in tropical areas where Lantana camara has naturalized, as livestock who graze on them frequently grow ill and die. South Americans have found ways to use the leaves medicinally to treat ulcers, and extracts made from the leaves are antibacterial and are used to treat other conditions as well. I learned about Lantana many years ago when I first planted them in my Virginia Beach garden, on a bank at the front of the yard in full sun. Once the leaves finally fall off in early winter, the woody skeleton of the plant is left. The birds dart in and out of the branches and peck at the remaining seeds throughout the winter. That first winter I didn’t know what to expect from them, but left them in place. I trimmed them back to a few inches when the daffodils bloomed, planted some sort of other annual around their stumps, and didn’t give them much thought…. Until, one day I realized there was new growth coming from the stump and branches. Several years old now, these “Bandana” series Lantana grew to over 6′ last summer. They definitely exceed the 24″ of growth promised on their label. This mound is covered in butterflies from sunrise until after sunset. Within a few weeks the stumps had disappeared beneath vigorous new branches, and by mid-June they were blooming again. 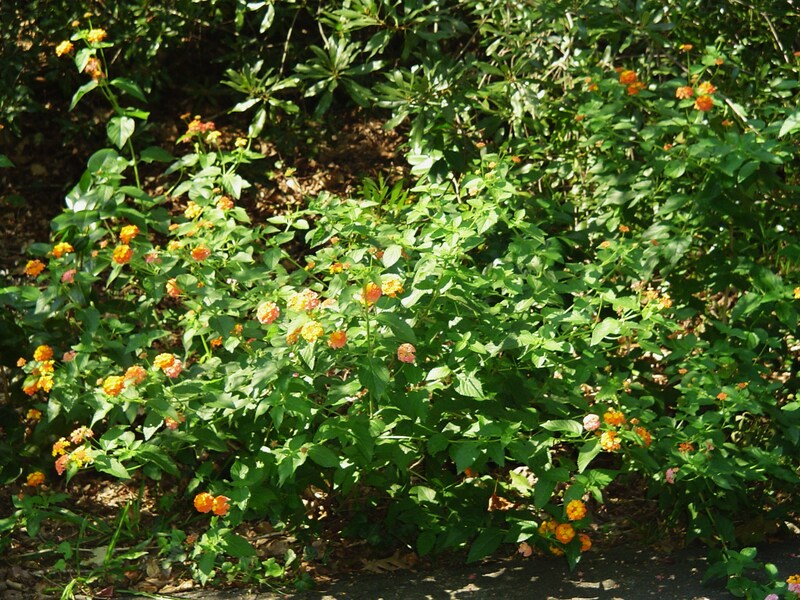 Lantana are actually grown as shrubs further south, and grow larger and more vigorous each year. 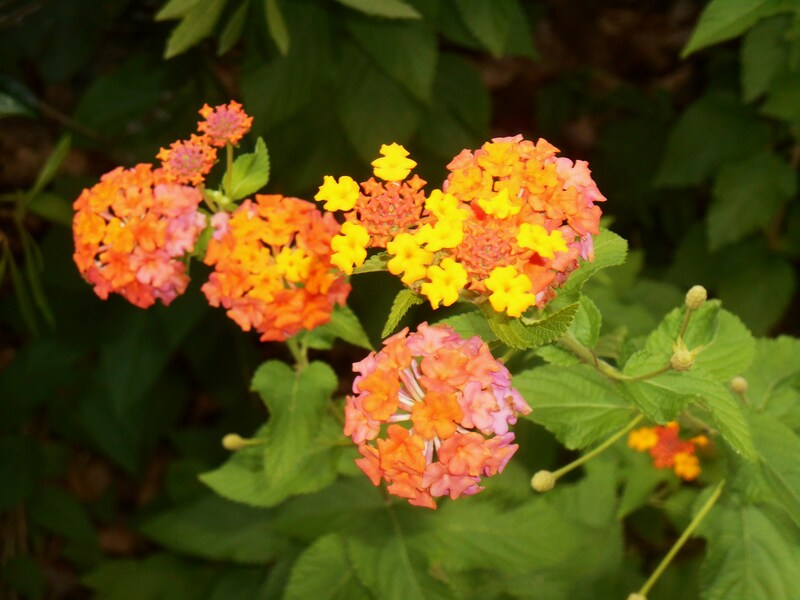 In some tropical areas of the world, Lantana camara are considered an invasive species. Their seeds are spread far and wide by the birds who feast on them. This has not become a problem in the United States, although they have naturalized along the Southeast and Gulf coasts. Lantana in the butterfly garden get regular trimming back, and still fill the path. 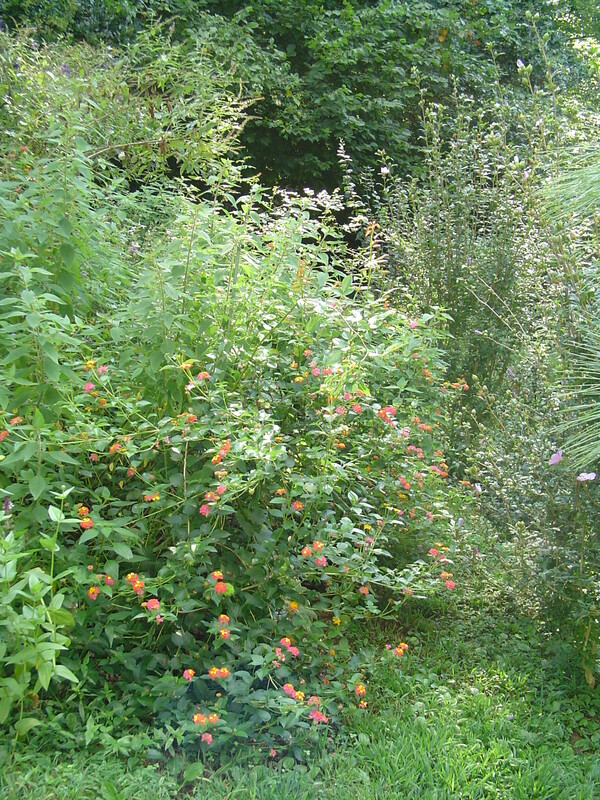 Moving to Williamsburg, one USDA Zone colder than Virginia Beach, I was concerned that I’d lost the joy of perennial Lantana. When I talked to Andrew Patton out at Homestead, he assured me that “Miss Huff” had proven reliably hardy here in Williamsburg. The front edge of our property is a very tough spot to garden. The dirt is hard packed and poor. The deer graze freely. There is only a narrow patch of dirt between the road and a thick hedge of Japanese Boxwood and Wax Myrtle, Myrica cerifera, with established roots which soak up what water and nutrients nature might provide. It is a long hike with a watering can, and too far for the hose. Whatever grows in this strip must be mostly self-reliant. So I bought enough “Miss Huff” plants, in little 4” pots, to plant in all of the open spaces between the shrubs along the street. It was more an attempt to protect the little Camellia bushes I’d planted the year before from the deer’s grazing than a serious effort at flower gardening. It took quite a bit of digging to break up the soil enough to even plant them, but I did, gave them a little mulch of compost, watered them, and waited to see what would happen. That first year, the answer is, “Honestly, not much.” They did bloom, but didn’t put on much growth. Every year since, the “Miss Huff” Lantana have gotten bigger and more colorful. All they get from me is a little topdressing of compost from time to time, a sprinkle of Osmocote or Plant Tone in the spring, and a little water in drought. I cut them back hard when the daffodils come up and then wait for the show. Our first spring in this garden, I ordered starts of Lantana from The Garden Harvest Supply Company for our new butterfly garden and the main flowerbed in the front yard. I ordered for color and size, not for hardiness, and frankly I expected them to die over the winter. I just wanted something drought tolerant that would fill the bed, attract some butterflies and require very little care during the season. That first year I ordered some of the Carolina Series and some of the Bandana series plants. At a little less than $3 per plant, they were a huge bargain. The following spring, I tried to “pull out” some of the dead looking plants in the front bed to replace them. Well, that was a huge problem. You see, in just one summer, the roots had gone deep and wide. It was like trying to dig up a tree with a trowel. I got one or two out, then gave up. In just a few weeks… You guessed it… there was new growth on the remaining plants. They weren’t supposed to survive here, but they did. This Lantana, planted in June, has made good growth for its first year. Lantana leaf out relatively late in the season. Patience is required. The woody stumps aren’t beautiful in a springtime garden. I’ve learned to plant bulbs around them, and to fill in with Violas, snapdragons, and other spring flowers and with perennial herbs like sage or thyme. About the time it gets too hot for the spring flowers, the Lantana will green up and begin to take off. Eventually you realize they have taken over the bed. I tried to establish lavender in the bed with the Lantana, but have consistently lost the lavender by late summer because they can’t compete with the Lantana for light and air. Lantana, ‘Sunny Side Up’ is a new hybrid expected to be as hardy as ‘Miss Huff,’ one of its parents. Since then I’ve planted Lantana of different varieties all over the garden. Anywhere there is full sun, and I need something big and bright, in goes another Lantana. I’ve stopped even reading the tag for hardiness. There is a trailing lavender Lantana good for hanging baskets or ground cover that is especially pretty. It is more reliable in the ground than overwintering in a basket. 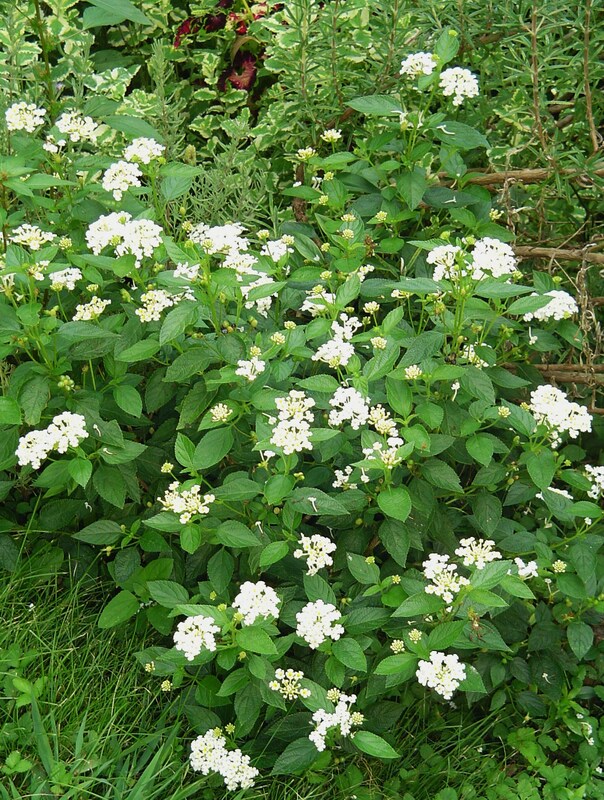 There is also a lovely creamy white Lantana I like in pots. I’ve even discarded a seemingly dead white Lantana from its pot, only to find it blooming a few weeks later where the root ball was “planted” to fill a whole in the yard somewhere. That plant has come back consistently for two years now. “Carolina Cream” Lantana in a large pot with Persian Shield, petunias, and Plectranths. 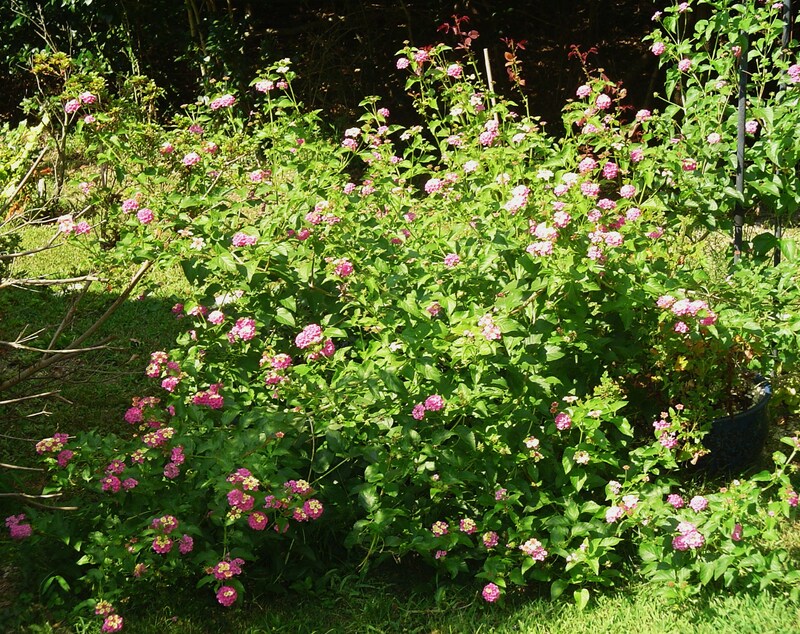 If you decide to plant Lantana, just keep in mind that you might not get a huge amount of growth the first year. The tags predict growth of about 18-24”, with usually more spread than height. You need to water regularly until the roots have a chance to grow; and fertilize, whether with compost, Osmocote, Plant Tone, or Neptune’s Harvest. Plenty of food and water in the first year gives you the best display of flowers. If your Lantana over winters, its roots have established and it will be much more drought tolerant in the second and subsequent years. Cut back hard and feed in spring. 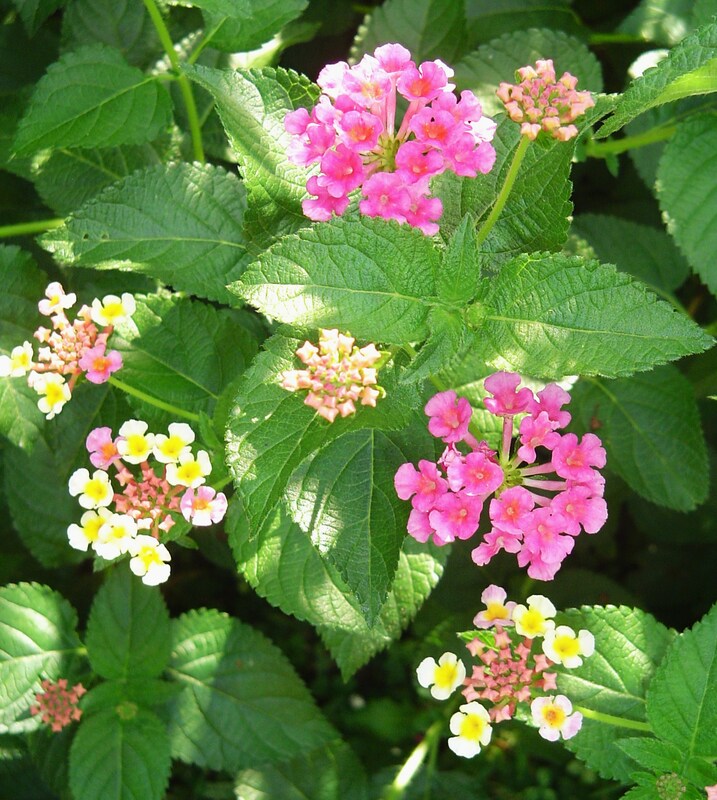 Lantana bloom on new growth, so it is fine to cut them back to 6-10” and then let them grow new branches. 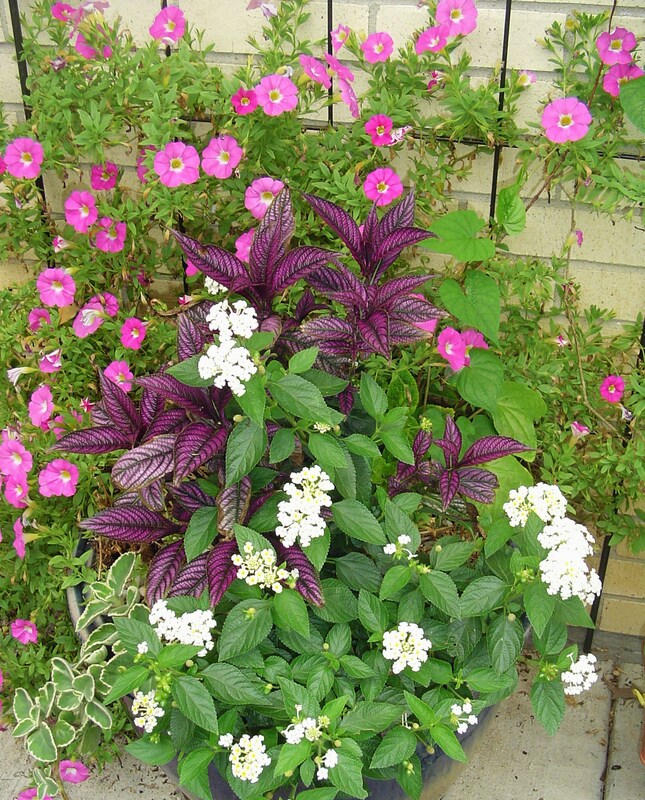 Give the plants a few inches of fresh compost, and maybe a sprinkle of Plant Tone or Rose Tone. After that, they’re on their own. 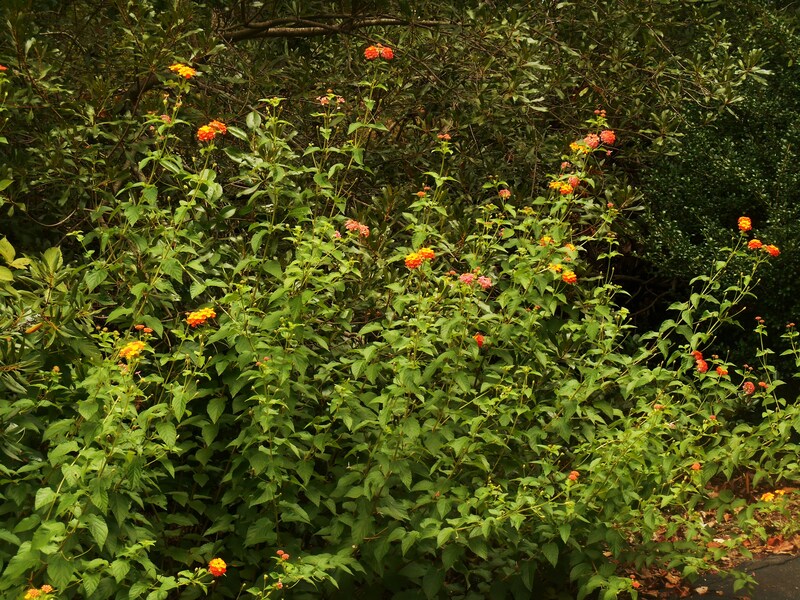 If you need to prune them during the season to give a nearby plant a chance at survival, you won’t hurt the Lantana. Last August we marveled at how high our Lantana grew in the front. We could stand beside the bed with Lantana branches towering over our heads. We are both tall, so the Lantana grew to more than 6’ in one season. Our blissed out butterflies don’t even mind when we come close to enjoy them. The hummingbirds gather to share the feast throughout the day, but fly off if we approach. 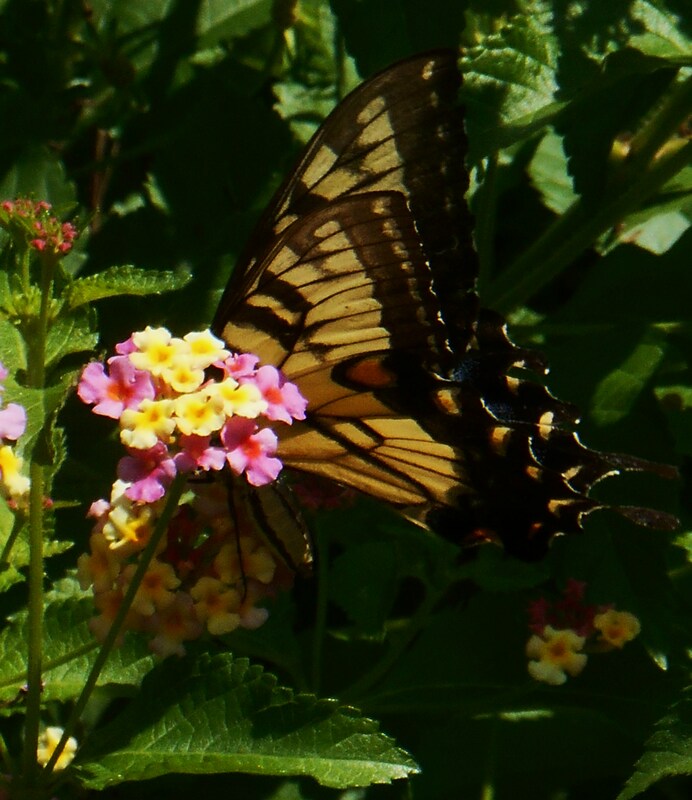 Lantana brings so much life to the garden, I’m happy to introduce them to my friends. Butterflies like it and deer don’t? I’m going to have to give it a whirl. I was thinking of buying marigolds to deter but I prefer Lantanas I think. I decided not to be such a snob this year and plant some dear repellents, marigolds, amongst all my butterfly and bee magnets because I am going through liquid fence by the gallon. If lantana is abhorrent to dear that’s cool because I know from experience it attracts bees and butterflies. It is a win win. I have grown Miss Huff in NC for the past 13 years, and it reliably comes back every year.. I have it planted in waste areas like the street edge which gets full sun, no supplementary water, the deer leave it be, the soil is mostly rock and clay. I leave the branches on through the winter which helps it from getting killed by the cold in the winter since the branches and leaves that get caught in the branches keep the root areas insulated. In the fall after the last frost date, I just take the hedge trimmer and cut as low to the ground as I can. 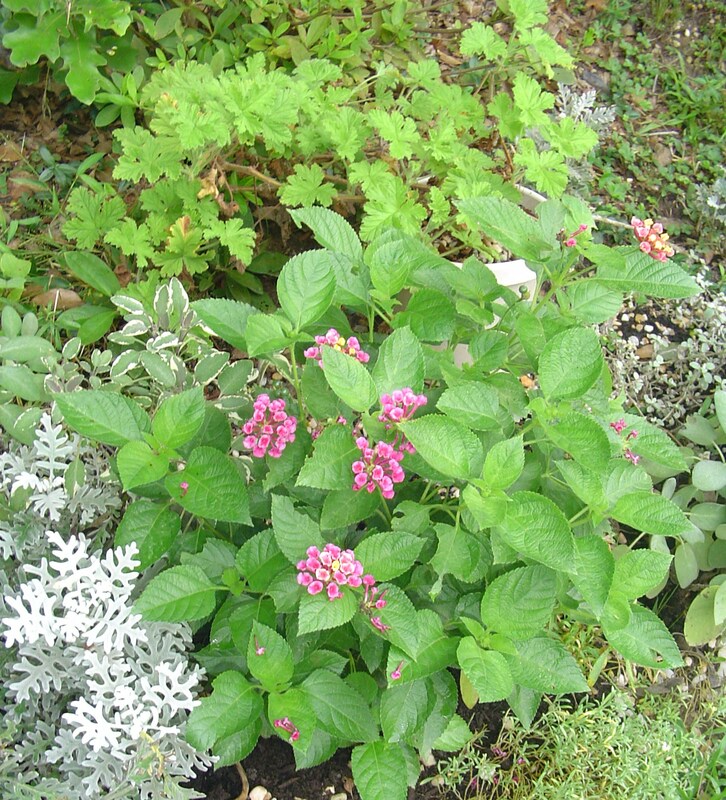 The Lantana actually improves the soil it lives in, some of the best “garden soil” I have is areas that the Lantana was in for a few years, the leaves break down, the roots break up the soil, it has made the area where I put them actually hospitable for other plants. I propagate it through cuttings or just division with some roots. It is as easy as mint to root from cuttings. From just keeping it in a cup of water, to sandy soil and rooting hormone. I’ve given dozens to neighbors as starter plants that I just rooted in yogurt cups. In a couple years from a cutting, you have a robust 2 gallon plant with roots filling the pot. Tons of butterflies, hummingbirds, bees. I think the smell of the crushed leaves smells more like gasoline than cat urine, but I don’t plant it for fragrance. It is not a small plant, each mature plant fills a 5 or 6 foot circumference mound by mid summer when cut to the ground. All without supplemental watering, or fertilizer. I love, love, love your blog! I too live in a woodland and am trying to make the area around my home and garden a beautiful flower and vegetable oasis, with a semi-wild border into the natural woods. I just discovered Miss Huff this year and I’m looking forward to years of low-maintenance lantana happiness. Have you ever had a problem with voles and the lovely Miss H? Thanks a million. Keep on posting and I’ll keep on reading!! Sounds great to me. 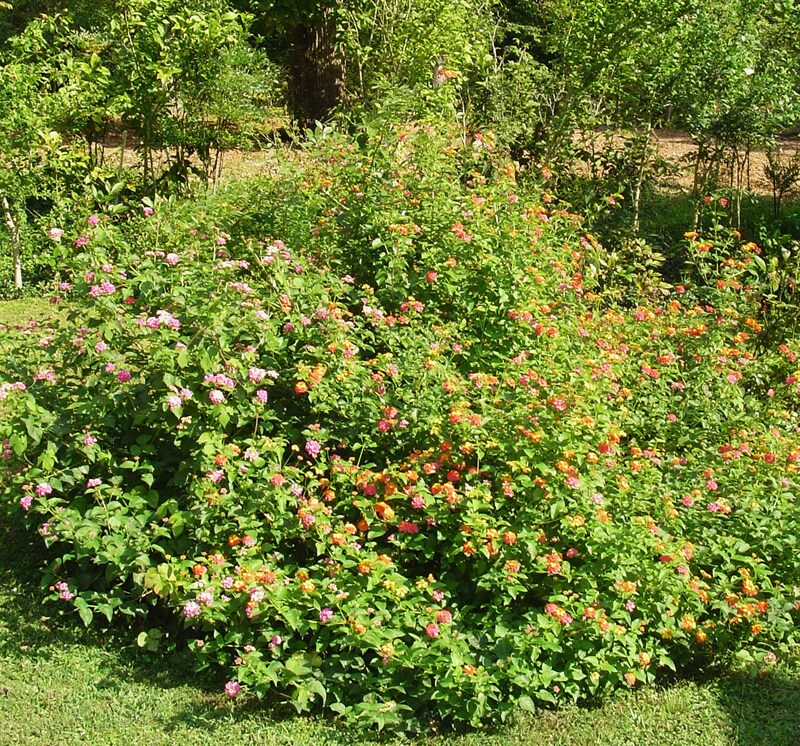 I’m thinking of adding Lantana camara to my garden here in Middle Tennessee. Since we’re at the edge of zone 6b / 7a, I believe I’ll start with Miss Huff and see if she is able to survive here. If that works out, perhaps I’ll try some others… Thanks for your detailed review!